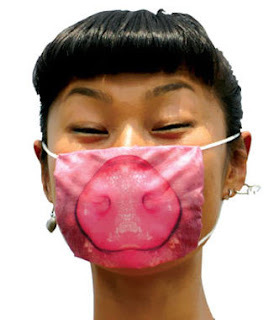 Q: What kind of surgical mask does the MB recommend for the coming swine flu pandemic? A: For this kind of, uh, "in your face" accessory, simple and understated is strongly recommended. And, white or light blue go with just about anything. Please, no pig noses. This is a good opportunity for designer surgical masks, like this MB prototype, inspired by British designer Paul Smith.